Great sword for the price. I have friends that have seen it. Pictures cannot do it justice. I love it and I expect some of my friends to get theirs! This sword was very nice. It had good heft, and very nice quality. But I would not call the scabbard high quality. It appears to be made of some composite material (maybe leather) but definatly not quality. That is why the 4 stars. I gave it as a gift to a friend. Good solid sword. Blade is nice and handle is pretty solid. It's a heavy sword and takes some getting used to but very nice. I bought mine a few years back (2002 I think) when it was offered for $35. You most likely won't regret paying what they're asking now. 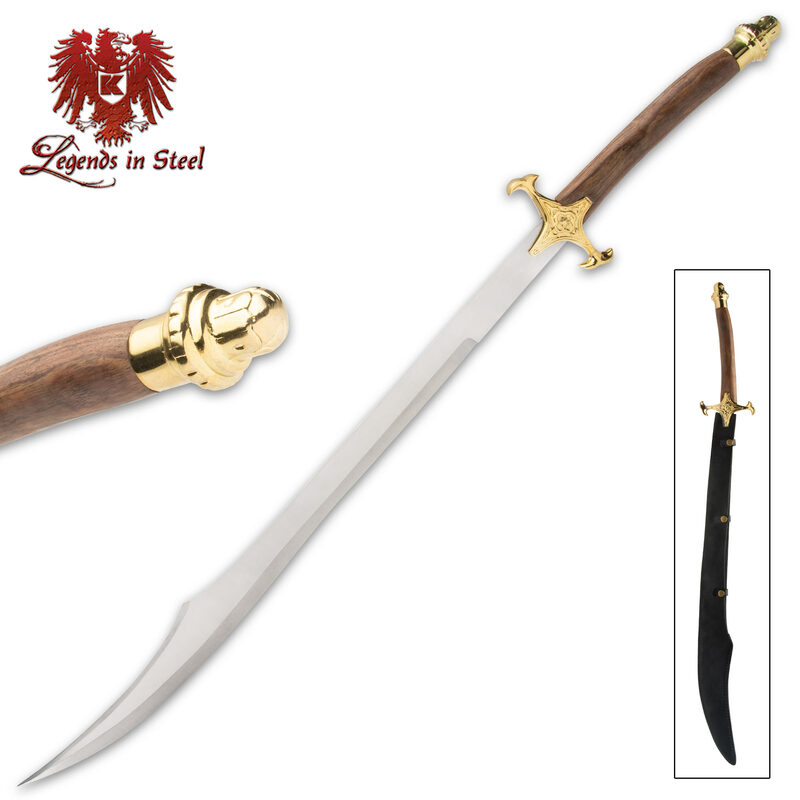 It is a very good quality sword for the price. I've done some light sparring with it and outside of a few nicks it's held up fine. The scabbard leaves something to be desired, but on the rare occasion I carry this piece I use my back hanger for it anyway. (Rare only because it's too fantasy for my reenactment troop). Over the last year or so the handle has picked up a slight crack along the wood grain, but not bad for a 10 year old sword that was never designed for actual combat! Unless you plan to only put this on the wall do NOT buy it. A sword this poor in quality isn't worth the money but I will admit that it looks very nice on the wall. Actually, shamshir is supposedly Persian for "Lion's tail", referring to the curved blade as opposed to the straight bladed broadswords used in the west. Unlike true shamshirs, which were light and fast, this beast is massive, an unlikely blend of the weight and heft of a broadsword with the shape and sweep of a shamshir that somehow works and works well! This is a close to an executioner's scimitar as it gets! Well, when i got the sword in the mail like 2 months ago, it was pretty sweet to say the least. The handle like as the site tells you is wooden; easily a foot long. For those who don't know about this sword and cant read the size, it is huge. In any case if you buy it you wont regret it at least I didn't. It's alright. The materials that go into it are pretty standard stuff, nothing like the musashi swords they sell here. The edge is sharpened and the pakistan stamp is there for the world to see. However, it is pleasantly heavy in the hand, I must admit. As a prop or even a costume piece, I'd use it. But this isn't the kind of sword that you wanna put in a collection, or have the intent of actually using. Still though, considering that it isn't full-tang, it holds together fairly well, and the sheath is sturdy enough. This sword is somewhat disappointing. The only good thing about it is how large it is. The blade has a wavy and uneven appearance. The guard and pommel came with slight chips and some corrosion. The guard is out of alignment by about a quarter of an inch and the blade wobbles slighty I assume because of this. One good point would be the sheath as the sword fits perfectly into place, although the second time I unclipped the snap to take the sword out it broke. From an appearance point of veiw i would not call it a display item and considering its numerous flaws it is no where near functional. 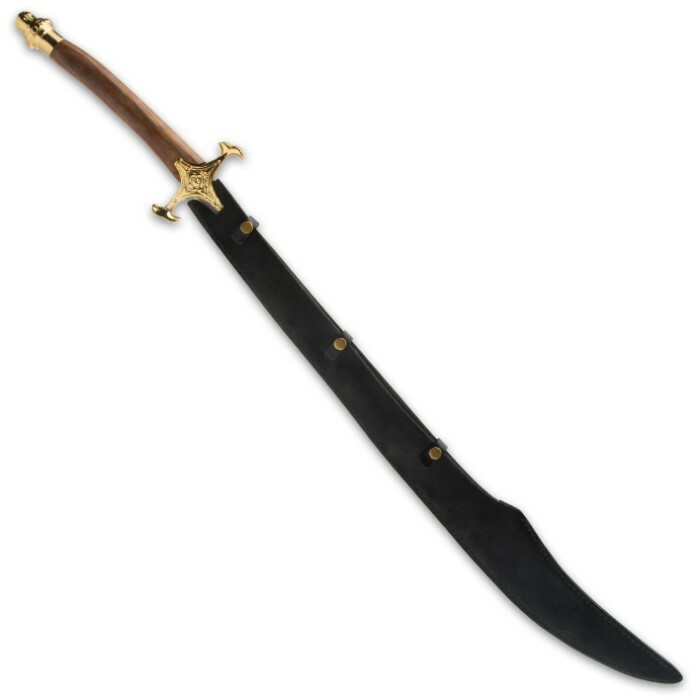 I would only recomend this item to someone that wants a very large Scimitar and is not too concerned with its overall look.